Ina Road exits are now open. 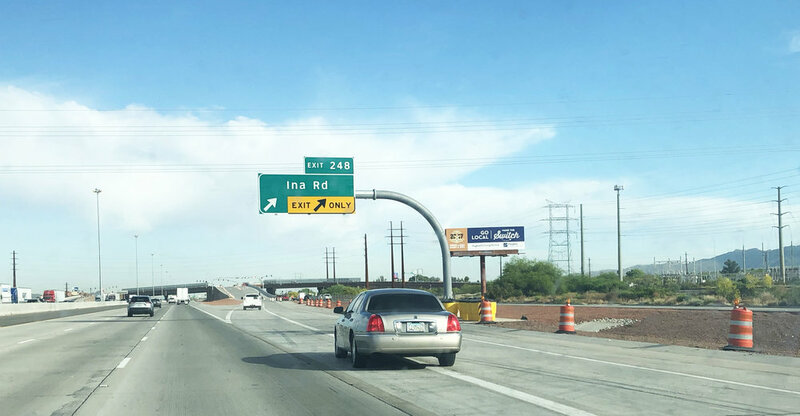 The Arizona Department of Transportation has opened all four ramps between Interstate 10 and Ina Road in Marana. The opening marks a significant milestone for the interchange reconstruction project that began in 2017. Although the ramps are open, crews must complete final elements of the project. Lane restrictions are scheduled to continue for the next several weeks. Ina Road is open with a single lane in each direction between Silverbell Road and Camino de las Capas. The westbound frontage road between Orange Grove and Cortaro roads will remain closed for the time being. Schedules are subject to change based on weather and other unforeseen factors. For more information, please call the ADOT Bilingual Project Information Line at 855.712.8530 or go to azdot.gov/contact and select Projects from the drop-down menu. For real-time highway conditions statewide, visit ADOT's Traveler Information Site at www.az511.gov, follow ADOT on Twitter (@ArizonaDOT) or call 511, except while driving.